Post subject: BII with Mac OS "Mojave"
Does anybody know if there is any problem when running BII (*) with the latest Mac OS "Mojave" ? Post subject: Re: BII with Mac OS "Mojave"
I see no reason why BasiliskII would not work in Mojave. However, I have here a newer 64bit SDL2 port from kanjitalk755/macemu source that will probably run better. I will post a link in the BasiliskII for OSX downloads topic shortly. No worries, BII builds old and new do run fine in 10.14.1. The situation may get tricky when 32 bit apps will be hindered from running by the OS. The SDL2 port is giving me trouble; --config isn't loading the config, and sparsebundles don't appear to be supported. Including lines like DSP causes the config to fail instead of just ignoring them. I never tried sparsebundles with BasiliskII. Did they work with previous BasiliskII versions? Yes it does. Perfect, thank you so much Ronald! Sorry, I forgot about it although I wrote about the sparsebundle support myself. Well, I've done some more work; turns out --config works just fine, but Mojave has added more limitations to how you can refer to files in bash. So the only thing not implemented appears to be sparsebundles. So the only thing not implemented appears to be sparsebundles. Nope; maybe I should switch to your build. With the one I'm currently using (Ronald's), it treats them as folders and won't load them as images. Any attempt to boot from a config file including a sparsebundle fails. Ronald, if you want this, please let me know when you've uploaded it so I can remove this copy from public view. Basilisk II V1.1 by Christian Bauer et al. If I convert it to a DMG, it opens fine; if I use SDL1 BII, the sparsebundle opens fine. But neither your build nor Ronald's will load; they just throw that error and go to the blinking question mark. Launch it to see that it works. 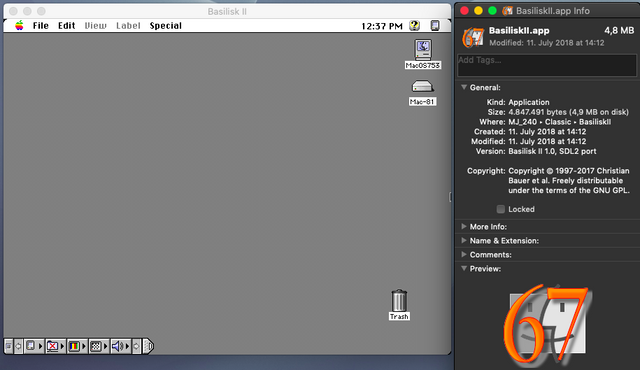 Go to Contents-->Resources and show contents of BasiliskII[.app]. 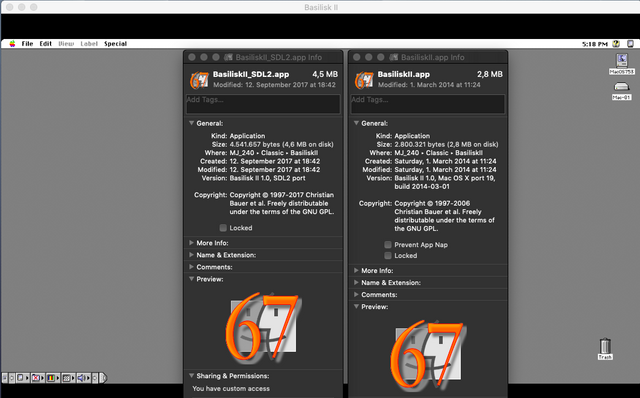 Then go to Contents-->Resources and replace System761.sparsebundle with your sparsebundle, but rename your sparsebundle System761.sparsebundle, or it won't work (unless you want to edit the AppleScript). This uses a shell script to launch the BasiliskII unix executable, unlike the standard application. Also, have you tried renaming the sparsebundle file to a short name with no punctuation or spaces? It can't hurt to try. Maybe there's a limit to the length of the filename? P.S. I make my sparesbundles by using your SparseBundler program. Last edited by emendelson on Tue Nov 20, 2018 1:17 pm, edited 1 time in total. Have you tried moving your sparsebundle to a different location and refer to it in prefs with the full path? No... that's my next task. This definitely seems to be a Mojave permissions-style issue, as the binaries themselves seem fine. I wish Mojave would expose all the restrictions rules in a single place that you could easily override; managing security's becoming a bit of a mess.